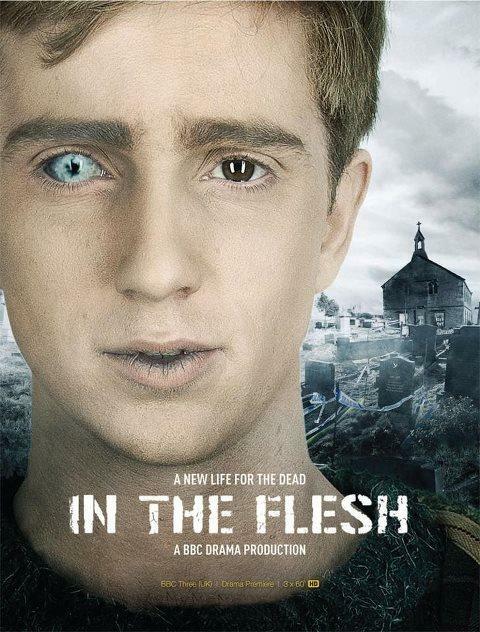 I have to admit that I was surprised to find out that the BBC had commissioned a second series for In the Flesh, given that it had initially been advertised as a limited mini-series. It certainly had a compelling premise that got me and my partner interested in the first place and now they've actually taken it upon themselves to extend the story further. And this is not a bad thing at all. So with this second season, I'm rushing back to write a review for the original mini-series in order to mark this show on the Geeky Guide. And the need to have it is is also drive by the fact that I really did enjoy it and respected what they were trying to achieve. I know I've already said this before, but it deserves saying again. UK television, whether we're talking about any of the BBC channels, ITV or Channel 4, there are so many interesting shows coming out of their creative efforts. With science fiction shows dying left and right on US networks, it's a relief that we're still seeing good stuff here. They may often be rather limited, but they tend to be of very high quality. Synopsis: In the Flesh is supernatural drama series created and written by Dominic Mitchell. It aired on BBC Three and won the BAFTA for Best Writer - Drama. The show takes place after a zombie apocalypse type event known as "The Rising." In that event, the dead of came back to life but in time the government was able to come up with a cure. And while the drugs do help restore their memories and more or less their humanity, there are still physical features that make it clear that they're the reanimated dead including pale skin and practically all-white eyes. These reanimated dead are termed to be suffering "Partially Deceased Syndrome" or PDS are given contact lenses, make-up and special medication to help them reintegrated back into society. One of the returned is Kieren Walker (Luke Newberry) and he is just about to be released after his rehabilitation. Given he was only 18 when he died, he is going to be returned to his parents. His sister, Jem (Harriet Cains), is actually a member of the local militia that continue to hunt down "Rotters" in the town. It's only natural she has mixed feelings about Kieren's return. And there's a greater story to be told in terms of the newly returned - how they died, how they came back and what they did while they were zombies. And that's a whole lot of story indeed. The story of the series is pretty tight in terms of how interconnected everyone is. Just look at the local militia aspect. Naturally they want to know about any Rotters moving back into the neighborhood and are prepared to defend themselves with lethal force. Jem clearly knows her brother has PDS, but of course it's not clear if she's going to disclose this to the rest of the militia. Then there's Bill (Steve Macy), the head of the militia and the father of Rick (David Walmsley), who was a very close friend of Rick's who had died in Afghanistan. And given the story is told across a mere three episodes, keeping the characters this close together really helps - it's a bit of a trick that we often see in role-playing games. I think what really drove this series to success was the fact that the back story of Kieren and many of the other characters were only revealed in snippets - and out-of-sequence snippets at that. At first the big reveal seemed to be some of the unspeakable things that Kieren had done while he was a zombie. But as things progress, there's a lot more complexity to Kieren's story and his relationship with Rick. And even the way that the militia and other anti-PDS folks wasn't taken to the level of caricature. They certainly had concerns about folks with PDS living among them, but they didn't immediate degenerate into some mindless, angry mob. Things progressed at an decent pace and it didn't end with some strange stereotype puritanical siege. Like many other shows of this nature, the biggest issue is the fact that it's only three episodes long. The show is powerful, well-written and ultimately leaves you wanting more. And thus we're all lucky that the story has been continued in the new second series. In The Flesh is great drama series that explores a very interesting premise - how we would live with the returned undead. It does it in a rather artful way and makes for some great television all around. Thus the show gets 4.5 disturbing revelations out of a possible 5.